Amyloid beta (Aß) plaques exhibit diverse conformations resulting in structural variants with distinct pathologies. 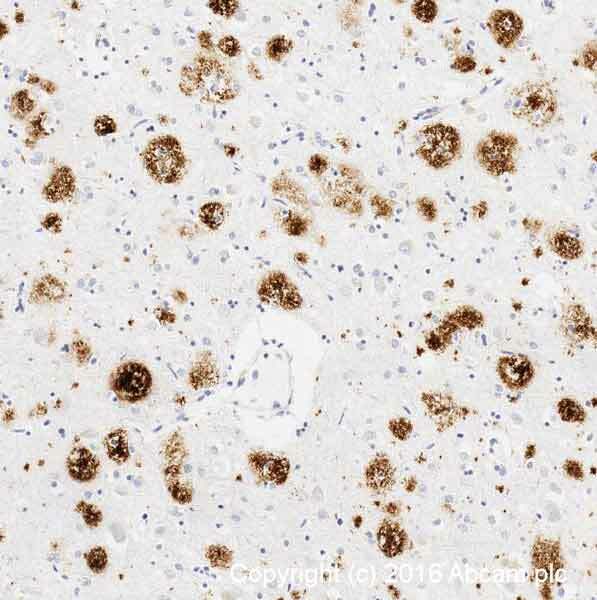 Ab218719, Conformation-specific Aß antibody panel, contains recombinant rabbit monoclonal antibodies against 1-42 fibrils that can distinguish conformation variation in amyloid structures. The antibodies in this panel have been validated using both Dot blot and immunohistochemistry staining on paraffin-embedded human and mouse model samples. Immunohistochemical analysis of 4% PFA in 0.1M PBS perfusion-fixed murine APP-PS1 transgenic brain tissue sections, labelling beta amyloid with ab201062 at a dilution of 1/200 incubated for 24 hours at 4°C in 0.1 M PBST with 10% donkey serum. Permeabilization was 0.1M PBS with 3% Triton X. Secondary was a polyclonal rabbit Alexa Fluor® 488 at 1/100. Counterstaining was DAPI against nuclear DNA and astrocytes stained with GFAP-Cy3. IHC image Amyloid Fibrillin staining in Human Brain Alzheimer formalin fixed paraffin embedded tissue section*, performed on a Leica Bond™ system using the standard protocol F. The section was pre-treated using heat mediated antigen retrieval with sodium citrate buffer (pH6, epitope retrieval solution 1) for 20 mins. The section was then incubated with ab205342, 0.1µg/ml, for 15 mins at room temperature and detected using an HRP conjugated compact polymer system. DAB was used as the chromogen. The section was then counterstained with haematoxylin and mounted with DPX. Immunohistochemical anaylsis of 4% PFA in 0.1M PBS perfused frozen murine APP-PS1 transgenic brain tissue, labelling beta amyloid 1-42 with ab201061 at a diution of 1/200 incubated for 24 hours at 4°C in 0.1 M PBST with 10% donkey serum. Permeabilization 0.1 M with 3% Triton X. Blocking was with 10% serum at 24°C for 1 hour. The secondary used was a Rabbit polyclonal Alexa Fluor® 488 conjugate at 1/1000. Counterstain was DAPI against nuclear DNA. The antibody labelled amyloid plaques and colocalised with neuronal marker NeuN (red) only in uneffected neurons. 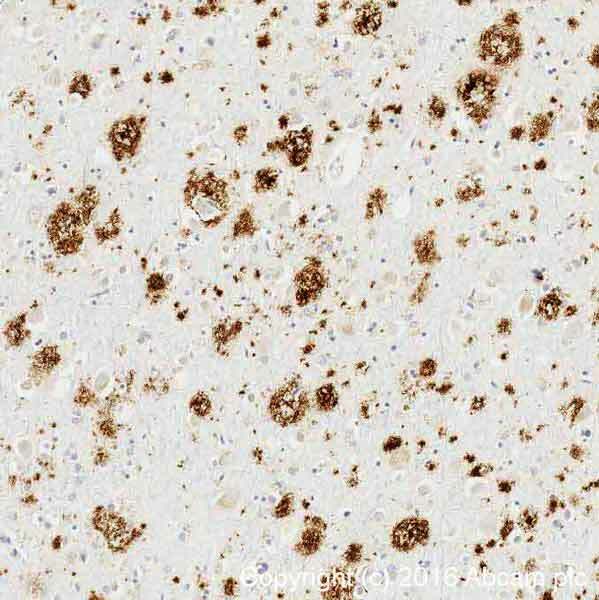 Immunohistochemical staining of human brain tissue from a patient with a diagnosis of Alzheimers disease, male, 81 years, 5 hour post mortem index, tangle stage 5, plaque stage B, mini mental status exam score 12. Sections were cut using a vibratome. No antigen retrieval was performed. Free floating sections were stained using ab201062 at a dilution of 50 ng/mL. The secondary antibody used was a biotinylated goat anti-rabbit at a dilution of 1/225, which was blocked with normal goat serum. The sample was visualized using ABC solution (1 hour incubation) followed by 1-4 minutes of DAB. The sample was mounted and allowed to dry overnight, followed by dehydration in increasingly concentrated ethanol solutions. IHC image of Amyloid Fibrillin staining in Human Brain Alzheimer formalin fixed paraffin embedded tissue section*, performed on a Leica Bond™ system using the standard protocol F. The section was pre-treated using heat mediated antigen retrieval with sodium citrate buffer (pH6, epitope retrieval solution 1) for 20 mins. The section was then incubated with ab205341, 1µg/ml, for 15 mins at room temperature and detected using an HRP conjugated compact polymer system. DAB was used as the chromogen. The section was then counterstained with haematoxylin and mounted with DPX. Immunohistochemical analysis of 4% PFA in 0.1M PBS perfusion fixed murine APP-PS1 transgenic brain tissue sections, labelling beta amyloid with ab201060 at a dilution of 1/200 incubated for 24 hours at 4°C in 0.1 PBST with 10% donkey serum. Permeabilization was with 0.1 M PBS with 3% Triton X. Blocking with 10% serum for 1 hour at 24°C. Rabbit anti-mouse polyclonal Alexa Fluor® 488 undiluted. Counterstaining was with DAPI against nuclear DNA and an ApoE counterstain in red. IHC image of beta Amyloid 1-42 staining in Human Brain Alzheimer formalin fixed paraffin embedded tissue section*, performed on a Leica Bond™ system using the standard protocol F. The section was pre-treated using heat mediated antigen retrieval with sodium citrate buffer (pH6, epitope retrieval solution 1) for 20 mins. The section was then incubated with ab201060, 1µg/ml, for 15 mins at room temperature and detected using an HRP conjugated compact polymer system. DAB was used as the chromogen. The section was then counterstained with haematoxylin and mounted with DPX. 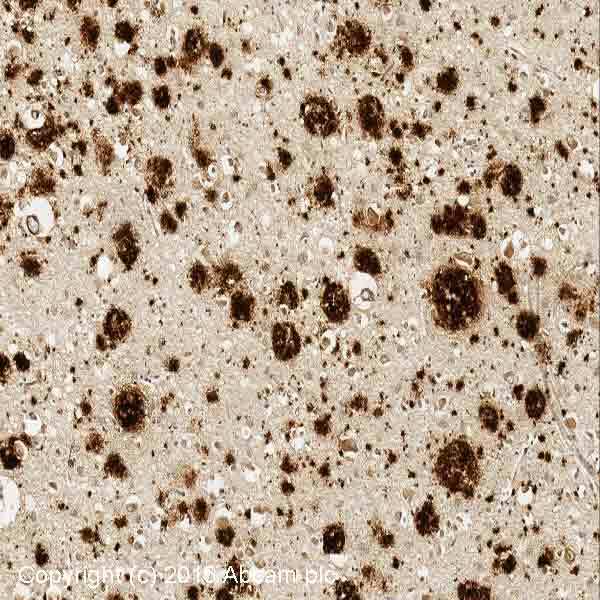 Immunohistochemical staining of human brain tissue from a patient with a diagnosis of Alzheimers disease, male, 81 years, 5 hour post mortem index, tangle stage 5, plaque stage B, mini mental status exam score 12. Sections were cut using a vibratome. No antigen retrieval was performed. Free floating sections were stained using using ab201059 at a dilution of 50 ng/mL. The secondary antibody used was a biotinylated goat anti-rabbit at a dilution of 1/225, which was blocked with normal goat serum. The sample was visualized using ABC solution (1 hour incubation) followed by 1-4 minutes of DAB. The sample was mounted and allowed to dry overnight, followed by dehydration in increasingly concentrated ethanol solutions. IHC image of beta Amyloid 1-42 staining in Human Brain Alzheimer formalin fixed paraffin embedded tissue section*, performed on a Leica Bond™ system using the standard protocol F. The section was pre-treated using heat mediated antigen retrieval with sodium citrate buffer (pH6, epitope retrieval solution 1) for 20 mins. The section was then incubated with ab205340, 0.1µg/ml, for 15 mins at room temperature and detected using an HRP conjugated compact polymer system. DAB was used as the chromogen. The section was then counterstained with haematoxylin and mounted with DPX. IHC image of Amyloid Fibril staining in Human Brain Alzheimer formalin fixed paraffin embedded tissue section*, performed on a Leica Bond™ system using the standard protocol F. The section was pre-treated using heat mediated antigen retrieval with sodium citrate buffer (pH6, epitope retrieval solution 1) for 20 mins. The section was then incubated with ab205339, 0.1µg/ml, for 15 mins at room temperature and detected using an HRP conjugated compact polymer system. DAB was used as the chromogen. The section was then counterstained with haematoxylin and mounted with DPX. ab218719 has not yet been referenced specifically in any publications. Publishing research using ab218719? Please let us know so that we can cite the reference in this datasheet. There are currently no Customer reviews or Questions for ab218719.